by amandab 4/15/2019 9:21:55 AM -- NORFOLK - Northeast Community College will celebrate the arts during a special evening on May 1. Poetry, prose, music and visual art will be featured during the fifth annual Arts Night on Wednesday, May 1, from 4:30-7:30 p.m., in Room 1108 in the College Welcome Center on Northeast’s Norfolk campus. “This is a wonderful opportunity to showcase the arts…and what better time is there to do that than with the release of our latest edition of Voices Out of Nowhere,” said Bonnie Johnson-Bartee, English instructor and creator of Arts Night. Voices Out of Nowhere is an anthology that dates back to the 1970s. It is a collection of student art work, creative writing and photography that is published annually by the Northeast Community College English Department under the supervision of Johnson-Bartee. The works are judged by published poets and writers and staff from the Norfolk Arts Center for the publication’s awards. Johnson-Bartee said Arts Night is an opportunity to bring student authors, artists and musicians together in order to display the variety of the talent that can be found at Northeast. The night will include performances by woodwind and saxophone quartets and a vocal ensemble. Students in Creating Poetry I and Creating Stories I and II will read from their works. Set designs for Leveling Up, the theatre department’s upcoming play, will also be on display. Johnson-Bartee said Arts Night will also feature an open mic session in which all writers are encouraged to read their works, and artists will be able to display their pieces. Artists must bring their own means to display the work, and work must be picked up at the end of the event. Northeast and its organizers are not responsible for lost, stolen or damaged artwork. Arts Night is free and open to the public. Light snacks will be provided. For additional information on Arts Night, contact Johnson-Bartee at (402) 844-7673. 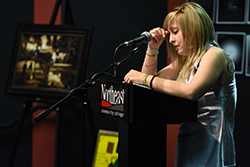 Celine Eggerling reads her short story, “Concrete Coma,” during Northeast Community College’s Arts Night in May 2016. The College will host its 2019 Arts Night on Wednesday, May 1, at 4:30-7:30 p.m., in Room 1108 in the College Welcome Center on Northeast’s Norfolk campus.